Walking the hot streets of Madrid and Valencia on my family’s trip to Spain last summer, all we could think about was drinking something cool — or eating it. While I just wanted to stop at every “100 Bocaditos” cerveceria we saw for huge 2 euro mugs of “tinto verano” (basically red wine and sprite, already mixed on tap), my dad was often on the hunt for a good gazpacho, a Spanish specialty, for good reason during the summer heat. 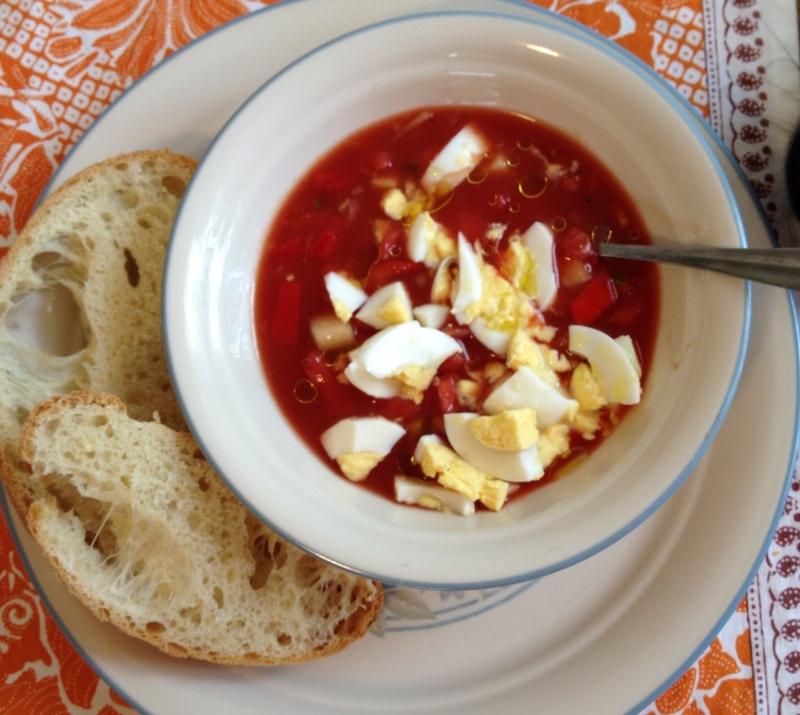 The cool bowls of healthy tomato and cucumber soup would offer a refreshment like no other. I wasn’t quite sure what I thought of the dish last summer, but a co-worker brought in a batch to work one day recently. He’s a great cook — and I was hooked. 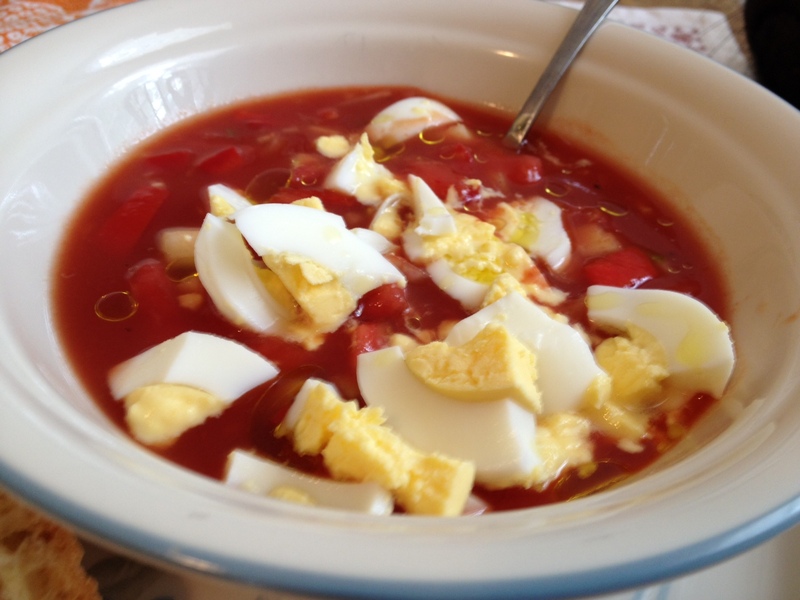 I first had gazpacho in the Yucatan Peninsula of Mexico back in high school in the ’70s. We went there to see the Mayan pyramids and ruins. Like Spain, it was also very hot there in the summer. Went out to dinner with Mom and Dad and had wonderful gazpacho, so cooling to drink that cold soup on a hot night. Along with Mexican and Spanish fare, there was a lot of Turkish food because the area grew hemp for ropemaking and Turks came over to make rope. So I remembered having gazpacho, shish kabobs (I think) and wonderful Turkish coffee in little cups full of grounds. The restaurant was built around a central open patio to help with cooling (no AC) and we dined outside on such a hot night. Dad lived a pretty simple lifestyle but he loved to travel and see new places and especially enjoy unique restaurants along the way. I’ve had quite a few gazpachos since then but none as good as the one in Mexico. Here’s the recipe I used from my co-worker (and frequent restaurant reviewer). It’s from Cook’s Illustrated, and is quite simple once you chop up all the fresh veggies. Tomato juice creates a good base, offering more flavor than just the tomatoes on their own. 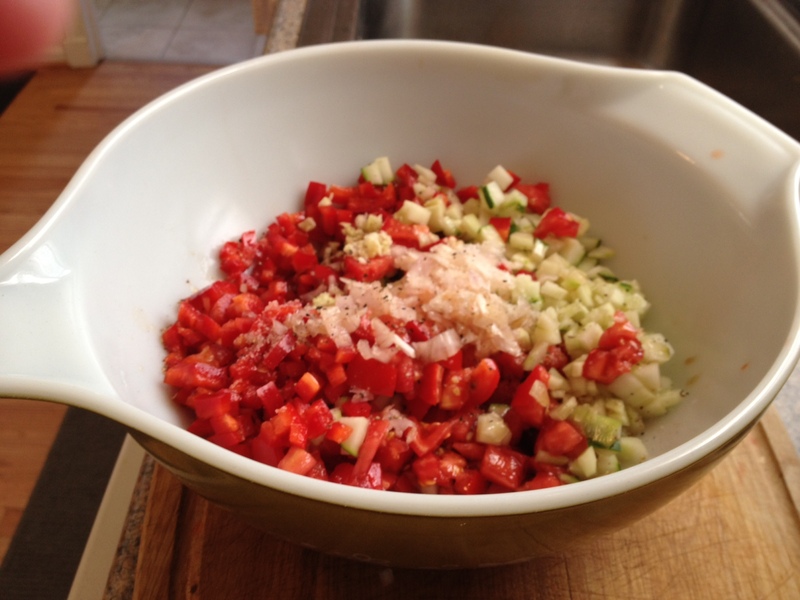 Combine the tomatoes, bell peppers, cucumbers, onions, garlic, salt, vinegar, and pepper in a large (at least 4-quart) nonreactive bowl. Let stand until the vegetables just begin to release their juices, about 5 minutes. Stir in the tomato juice, hot pepper sauce, if using, and ice cubes. Cover and refrigerate to blend flavors, at least 4 hours and up to 2 days. Adjust the seasonings with salt and pepper and remove and discard any unmelted ice cubes. Serve cold, drizzling each portion with about 1 teaspoon extra-virgin olive oil and topping with the desired garnishes. What else do you like to do with tomatoes? 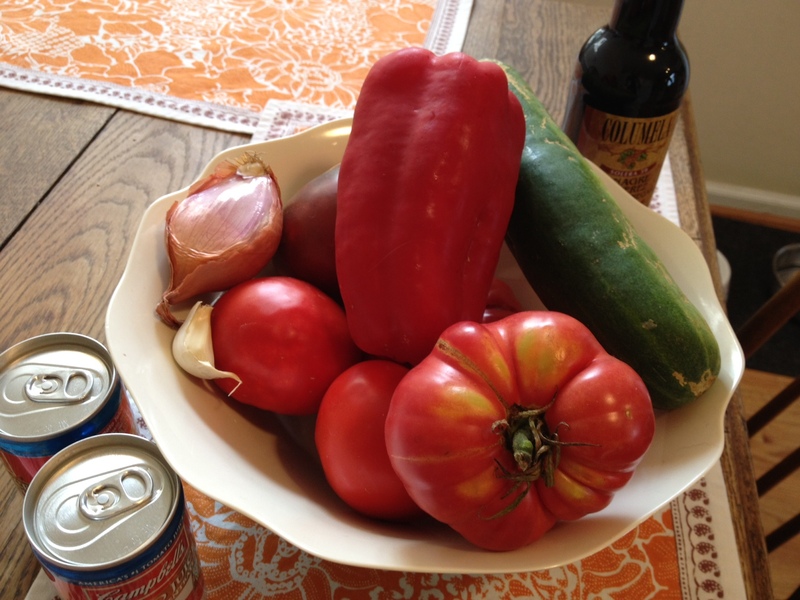 Here are some ideas and a recipe for green bean and tomato salad with goat cheese. Looks sooo yummy. I will be trying this very soon! katalina I definitely need to give you those other two recipes. Or maybe we can make them at the beach! I’m going to be making this soon!